Sunday morning’s Water of Life…. 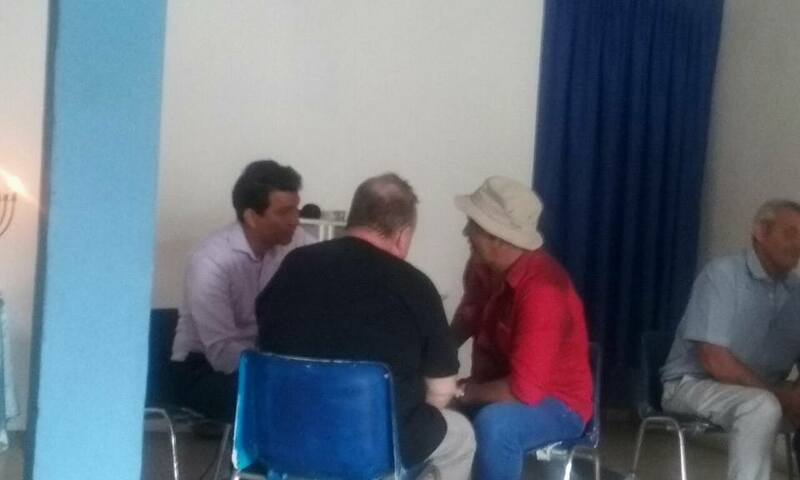 Wonderful meeting yesterday morning at Iglesia ‘Agua de Vida’ – Water of Life Church, Napoles. Yet another church it’s my privilege to visit regularly, pastored by the lovely Angela Mondragon and her husband Jesus Osorio, in Napoles, on the edge of the city. God always blesses there: they have a lovely spirit, it’s a church with a beautiful atmosphere. When people come up for prayer there, it’s always, first, to tell of what God healed on the last visit. That’s so encouraging, such a blessing. All sorts of things – hernias, arthritis, diabetes – one young lad had type 1 diabetes in November, and now no longer has it…. 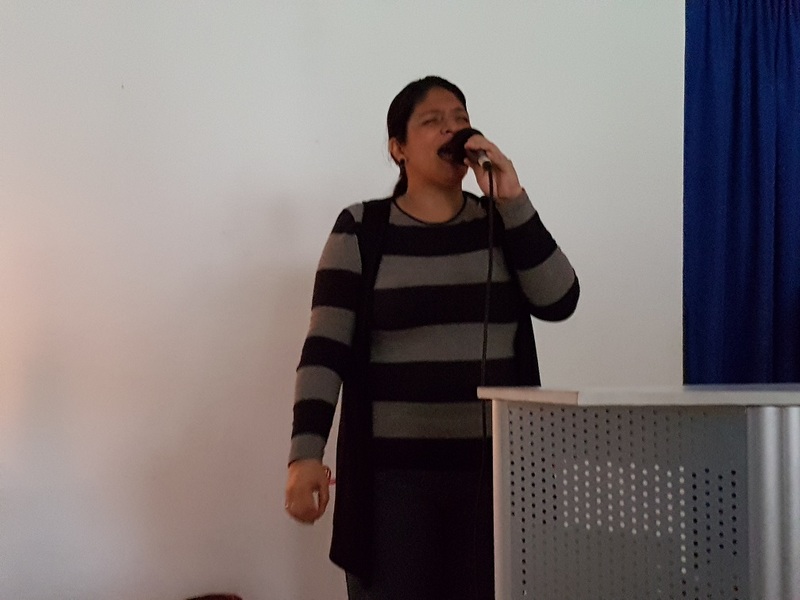 True worshipper Angela Mondragon, Pastor of Agua de Vida church, yesterday…. Thanney has been great at setting the tone for each ‘preach’ and ministry time, yesterday was no exception. 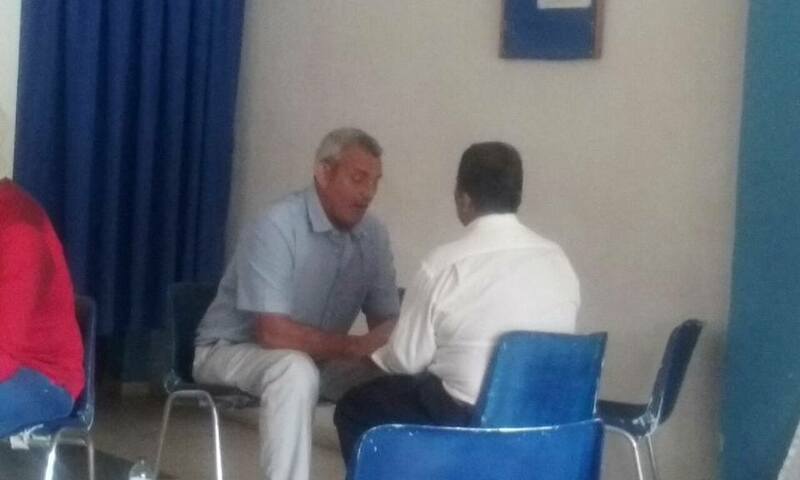 People are loving hearing the testimonies he has from October – November, esepcially after he tells them that he never had any thoughts of praying for people on that trip, as he’d never done it before! The day had begun a little earlier than we’d anticipated, as at 8 am., we had a lovely couple come to the apartment here for prayer: Ana Maria and Ricardo: and how it happened was lovely. Revelation 19:10 says that ‘the testimony of Jesus is the Spirit of Prophecy’. So when you tell of what Jesus is doing, as well as what he did, it becomes a prophetic word for you to claim for yourself. Ana Maria and Ricardo had seen the testimony on my blog/facebook of Carolina, last Sunday, telling of how she and her husband had long wanted children, and how, in November, Thanney had prayed for them, with Carloina now 4 months pregnant… Ana Maria and Ricardo have longed for kids for 10 years, and through their pastors, Ana Lucia and Juan de Dios (the dentist and her husband) – were put in touch with us. We had a super time with them for over an hour: and look forward to hearing of the ‘fruit’ in the weeks ahead…. And so to ‘Agua de Vida’ – such honouring again, from the people and pastors: God’s blessed me so amazingly this trip with the public honourings I’ve listened to….perhaps it’s because I’d begun to think a year or so ago that, after 20 years, I’d reached my ‘best before’ and ‘sell by’ dates here…. God knows the love have for this city, this country, and – much more important – the people, who have been friends for two decades…. If I’m honest, with the lovely man in the picture above, I’d have chosen his sight to come back first…. God didn’t do that. Instead, he proved that he was a work in his spine, and all the pain in his spine, back, shoulder, and arm went. He hadn’t been able to lift his arm above horizontal – and only then with excruciating pain – and he picked up my Bible bag: it’s pretty heavy – Bible, full bottle of water, phones, gadgets to charge the phone, cistomary breath mints (for ministry times!!) – and at full length, he lifted it from the floor, arm extended, above his head…. no pain, no restrictions, no limitations. Without the bag, he could hold his arm fully vertical…. and he’s in complete faith that God will give him sight back (so am I!) if he’s done this much healing for him. Jesus never half heals…. One dear lady was totally healed of osteoarthritis all down her left hand side: having been healed of it all down her right hand side in November! 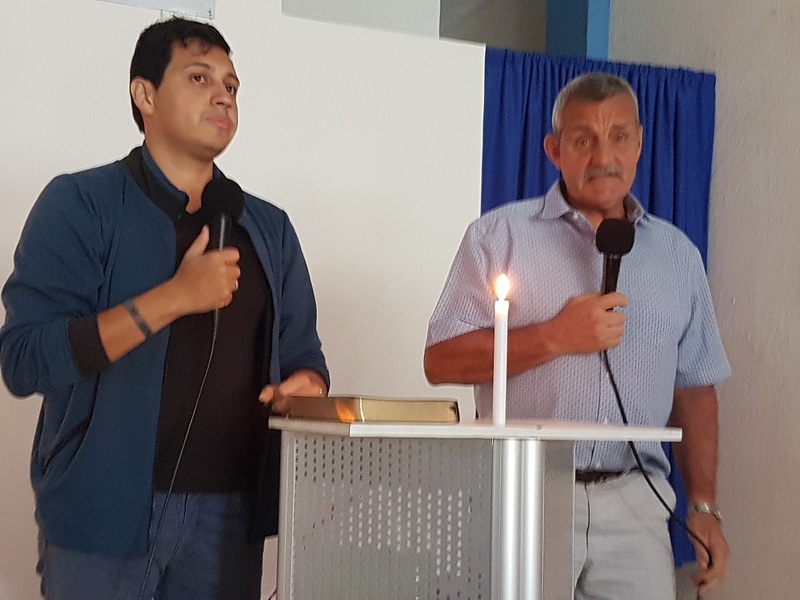 It was funny, as there were probably about 30+ people in the meeting, but Thanney and I – along with Wilmar and Johan – reckoned we prayed for at least 50% more than that – people were coming in off the street (the church opens onto the main street – I love that, too! – and others were going home to bring people back. Lots of miracles, healings – from Thanney too – and such a blest, powerful morning of being in the presence of God. I love Jesus and Angela dearly: they are an amazing, delightful Pastor ‘team’ in their church, so kind, so hospitable, welcoming, generous, hospitable. It’s such a poor neighbourhood where their church is – you might recall from October-November’s blogs about the barrio, Siloe – well, it’s sort of an extension of Siloe, as is the village we were in last night, La Sirena. I so want God to prosper this lovely couple, and he is, and he will. God willing, Jesus is helping Thanney tomorrow (Tuesday) at the Foundation, with the construction. I’m so glad that they’ll get to spend time together, even if one doesn’t speak Spanish and the other just a little English. Their spirits will ‘rub off’ on each other…. Will all these little miracle Columbians be named Thanney?